NEW ORLEANS – There’s nothing like waiting until the last possible moment to make things really interesting. One week after The Bowerman Watch List went unchanged from the previous release, 3 women made their season debuts as semifinalists for The Bowerman, announced on Wednesday by the U.S. Track & Field and Cross Country Coaches Association (USTFCCCA). Maggie Ewen RS JR Arizona State Throws St. Francis, Minn.
Kyra Jefferson RS SR Florida Sprints Detroit, Mich.
Keturah Orji JR Georgia Jumps Mount Olive, N.J.
Raven Saunders JR Mississippi Throws Charleston, S.C.
Kendell Williams SR Georgia Combined Events Marietta, Ga.
Shakima Wimbley SR Miami (Fla.) Sprints Fort Lauderdale, Fla.
Stellar showings at the NCAA Division I Outdoor Track & Field Championships in Eugene, Oregon last week propelled UTEP’s Tobi Amusan, Florida’s Kyra Jefferson and Kent State’s Danniel Thomas into the picture for track & field’s most prestigious award. While the honor is a 1st this season for Jefferson, the senior from Detroit, Michigan has been here before. Jefferson has graced The Bowerman Watch List 6 times in the past, with the most recent honor coming on Feb. 3, 2016. But her performance in Eugene this past week earned her semifinalist status, and for good reason. The sprinter for Florida broke a 28-year-old collegiate record in the 200 meters with a championship-winning time of 22.02 to surpass LSU’s Dawn Sowell by 2 one-hundredths of a second. Her nearest competitor finished 0.37 seconds behind her, marking the largest margin of victory since the all-time meet best of 0.44 was set in 1992. Amusan and Thomas were fantastic throughout the regular season, but winning championships on the national stage is how they shot up the ladder. Amusan, the defending runner-up in the 100 hurdles, went out and became the 4th-best performer in the event in collegiate history with a time of 12.57 to claim UTEP’s 1st title in that event since 1984. Thomas won Kent State’s 1st shot put title in school history with a mark of 19.15m (62-10) that makes her the 2nd-best performer in collegiate history. 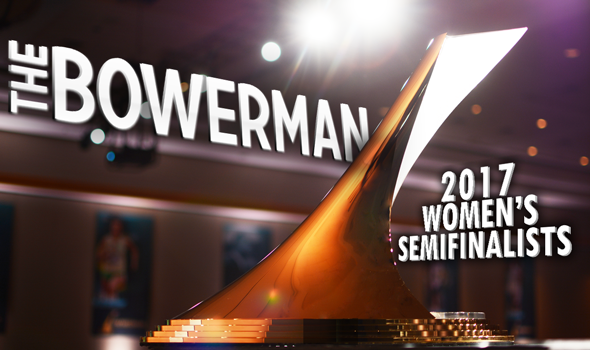 Amusan marked UTEP’s 1st appearance by a woman on The Bowerman Watch List since Blessing Okagbare on May 7, 2010. Thomas’ honor was the 1st of its kind – regardless of gender – for an athlete from Kent State. Another national champion returned to the mix as a semifinalist in Missouri’s Karissa Schweizer. Initially making her debut on the Watch List back on March 15, Schweizer had been absent until Wednesday, thanks in large part to her 5000 meter title in Eugene. With a time of 15:38.93, the native of Urbandale, Iowa became just the 4th woman in NCAA Division I history to win the indoor and outdoor 5000 meter titles and the cross country championship all in the same season. The remaining 6 semifinalists have been stalwarts on the Watch List throughout this season. Mississippi’s Raven Saunders, Oregon’s Raevyn Rogers and a pair of Georgia Bulldogs in Keturah Orji and Kendell Williams have appeared on every Watch List on the year, and the semifinalist list is no different. Rogers helped the Ducks claim the 2017 NCAA Division I Outdoor Track & Field Championship with a pair of titles of her own. The native of Houston, Texas won the 800 meters with the 6th-best performance in collegiate history with a time of 2:00.02. She became the 1st in meet history to win three-straight 800-meter titles during the outdoor season. Additionally, Rogers ran the anchor leg of the collegiate record-setting 4×400 relay squad that posted a time of 3:23.13 to clinch the title for Oregon. Orji and Williams were part of a record-setting day for the Bulldogs, as Georgia was the national runner-up by scoring 62 1/5 points in just field events, marking the most points scored in field events by a single team in meet history. The two semifinalists played a major role in that, as Orji totaled 18 points for the 2nd-most of any athlete this year while Williams added 10. Orji won the triple jump title with a mark of 14.29m (46-10¾) to become the 1st woman to win 3-straight in that event in addition to finishing 2nd in the long jump. Williams captured her 3rd heptathlon title with the 4th-best mark in meet history (6256). Arizona State’s Maggie Ewen and Shakima Wimbley of Miami (Fla.) joined the Watch List midway through the season, but finished out the season in strong fashion to earn their way onto the semifinalist list. Ewen scored more points at the NCAA Division I Outdoor Track & Field Championships than any other woman with 21 points. The native of St. Francis, Minnesota set the collegiate record in the hammer with a mark of 73.32m (240-7) before going on to finish as runner-up in the discus and 6th in the shot put. She became just the 6th woman in history to score points in all three events at the outdoor national meet. Wimbley finished her collegiate career as the runner-up in the 400 meters with a time of 50.68. She and three others also finished 7th in the 4×400 relay for the Hurricanes, crossing the finish line in 3:28.90. Three finalists will be named on June 21.